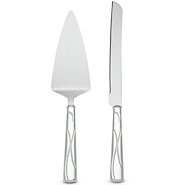 The fanciful Adorn ribbon motif of delicate loops accents the handles of the elegant Adorn Cake Knife & Server. Perfect for serving wedding cake and more. The shining silver plating makes this set a wonderful gift. Length: Knife: 8 3/4" Server: 8"